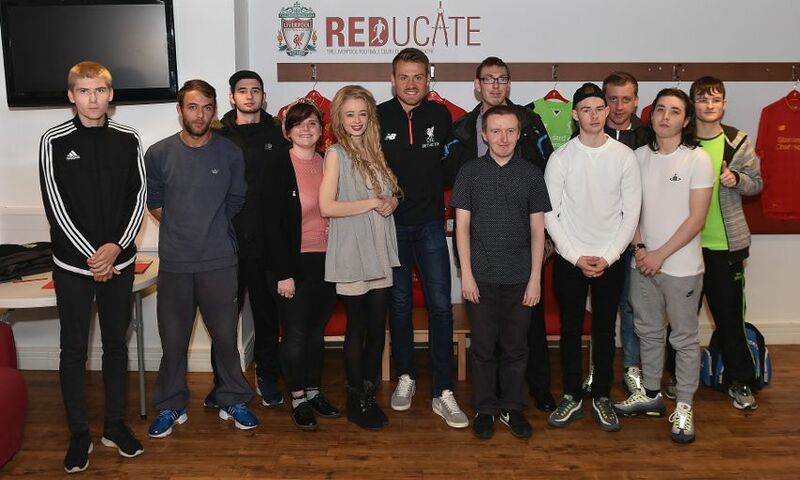 Liverpool goalkeeper Simon Mignolet paid a special visit to Anfield yesterday to meet local young people taking part in a new Premier League programme. The club’s official charity, the Liverpool FC Foundation, is delivering the new Premier League Works programme, which engages local young people aged 18-25 years who are not in employment, education or training (NEET) to help them progress along their employment pathway. Through an innovative combination of one-to-one support, personal development workshops, work placements and community action, the pilot programme aims to inspire and support the young people onto the next stage in their lives. Based at Reducate - standing proud in the Kop stand - the programme, delivered in partnership with the Professional Footballers Association and the Prince’s Trust, provides young people with support to develop their personal and social skills giving them the confidence and experience they need to make a positive transition back into education, access training or gain meaningful employment. Andrea Cooper, head of the LFC Foundation, added: "This programme provides unemployed young people with an opportunity to develop work skills, attributes and knowledge to bring them closer to the job market.